4 Seasons - Golden Clover's I Wanna Go Faster! There is so much to say about this spunky little girl! She loves people and can be quite a handful when excited. However, she will calm right down and stay on the floor right beside your chair and wait patiently for an ear scratch. She has a lovely headpiece and beautifully proportioned body. She has correct movement and a sweet golden temperament. She definitely likes to cuddle! 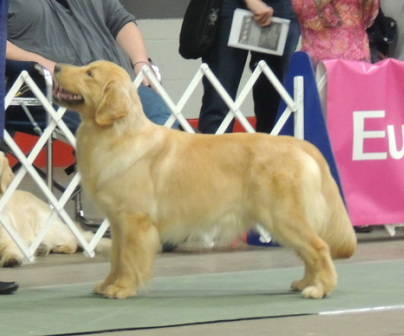 She is a granddaughter of our LoverBoy who was a son of 3-time National Champion, Hobo (CH Summit Mr. Bojangles) and has a rich, lovely pedigree from the Laurell Golden lines. Shelby and Sabrina Prim at the Louisville, KY Shows March 2013.